There’s a whole lot of awesome happening on this cover. Pop Flamer is about a mouse that happens to be named Pop Flamer. He pops balloons to progress to the next level. He charbroils his enemies – frogs, dragons, and Muppet rejects – with a flamethrower. When he drinks from serums located at both the top and bottom of the stage, he becomes Super Mouse (not Super Flamer?) and crushes his enemies simply by touching them. Pop Flamer the mouse is a badass. The premise of Pop Flamer the game is badass. 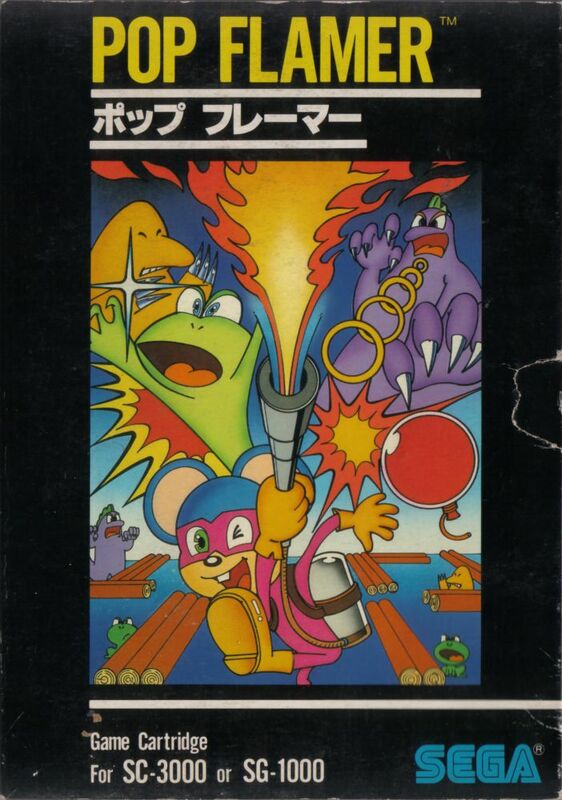 Who wouldn’t be hyped to play a flame thrower-wielding mouse, presumably out for revenge and all the balloons he can pop? Lincoln Log-surroundings or not, Pop Flamer is abnormally tough. 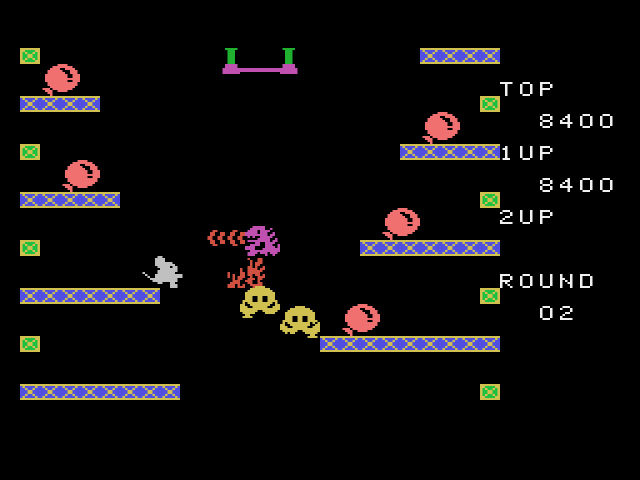 Unfortunately, Pop Flamer‘s fantastic, 80s-riffic premise is undermined by stiff controls and overbearing difficulty. The enemies are stupid, aggressive, and outnumber you four to one. Yes, you have a flamethrower, but your maneuverability is limited, thanks to cramped stage layouts and overabundance of enemies. Should you set the creatures ablaze (it’s a little disturbing to watch a smiling frog go up in flames), they immediately regenerate from a door in the middle of the level, leaving you little resting time. After a few creature bonfires, your flamethrower’s reach will shorten. Pop balloons to refill the flamethrower, but don’t be surprised if some balloons don’t pop, even as you walk over them. After several playthroughs, I noticed that it was best to approach and pop each balloon from a different angle, though I never understood why. Drinking the serum to turn into Super Mouse was a pointless endeavor, as well. Even if you place Pop next to the serum and press buttons like mad, he won’t drink at all. Despite my best efforts (the serum has a straw coming out of it, for crying out loud! ), I never saw Pop turn into Super Mouse. This led me to believe that Super Mouse, like Pop Flamer itself, was an unrepentant sham. You get busy flaming or you get busy being flamed. 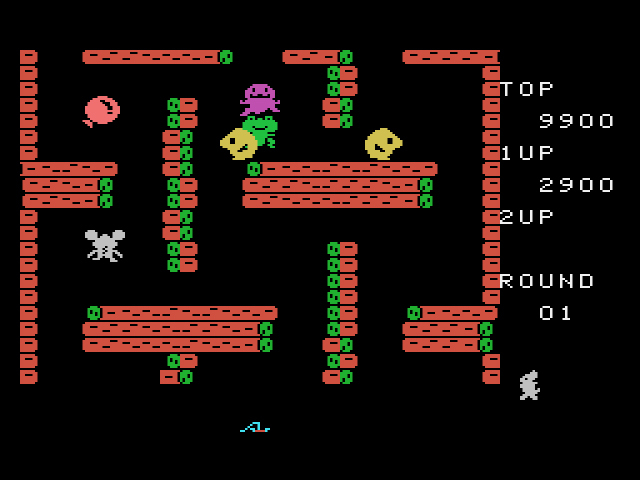 Pop Flamer had two responsibilities: turn a mouse into an 80s action hero and be a serviceable arcade game. Challenging objectives, to be sure, and the SG-1000 version of the game failed at both. Whether the game’s arcade counterpart (developed by Jaleco, not Sega) achieved these goals, I can’t say, as I was unable to play a version that worked on my computer. Nevertheless, if SG-1000 Pop Flamer proves anything, it’s that badass ideas don’t always translate into badass gameplay. I was kinda hoping this was going to be one of the better titles, but alas no. So far only two good SG-1000 titles in Star Jacker and Monaco GP. Hopefully Sega Galaga will increase the good game ratio. Some of these aren’t bad choices, but I dunno man, I can’t ride for Flicky. Well the cover made it look interesting. Too bad about the controls as this game looks like one I’d enjoy. Here’s hoping you come across a great SG-1000 game soon. Odd that you couldn’t get the arcade version running. Do you have an android device? Seems to run fine on mame4droid. I have the opposite problem, can’t get the sg-1000 port running on my Sega emus. Never mind, got this port up and running. You’re right about the balloons not always popping when you touch them, obviously some kind of glitch. Maybe the SG-1000 version was slower when it came to the serum… Only one time did it look as though the mouse was drinking any.